Got to hand it to first-time director Sankalp Reddy: he sure aims high. He merits full marks on that score. But like the torpedoes fired in the film, The Ghazi Attack misses its mark more often than not, notwithstanding the impressive scale of its ambition and execution. 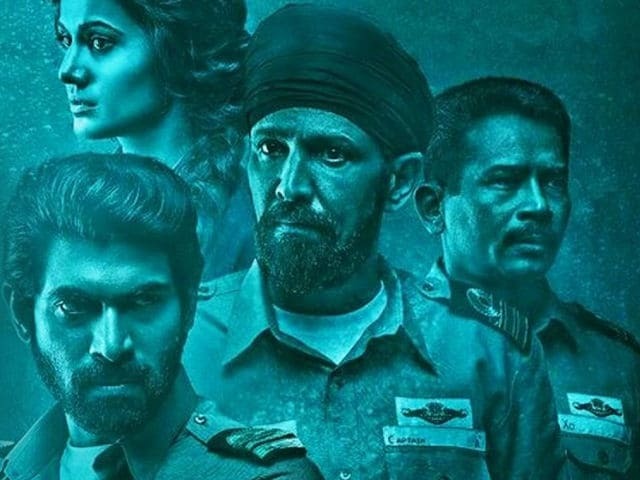 The film, made in Telugu and Hindi, imagines the circumstances in which the Pakistani submarine PNS Ghazi sank in the Bay of Bengal a day after India joined the 1971 war to liberate Bangladesh. The Ghazi Attack delivers many a riveting moment and is bolstered by the talent of a few capable actors. Its plot however, is devoid of any mystery. It combines the time-tested generic conventions of the Hollywood submarine movie with a sweepingly constructed indigenous mythology of war that sails on waves of unalloyed patriotic fervour. In an extended disclaimer, The Ghazi Attack disavows any claims on "historical accuracy". It also admits that there might be other versions of the PNS Ghazi incident out there. So when the audience is asked to take what is going to unfold on the screen with a pinch of salt, should we get all worked up over the things that this film skirts around, notably songs, dances and other diversions? On the positive side, The Ghazi Attack offers an unprecedented and detailed peep into the workings of a Navy submarine and its crew although much of what is said and done in the course of two hours and bit could still be gobbledygook for the lay viewer. All that we can figure out amid the high-voltage action and the heroic declamations is that two sets of men in uniform, each as convinced of their nation's might as the other, are plotting to hit each other where it hurts. The Ghazi Attack revolves around an undersea dogfight between the S-21 (presumably INS Karanj, the name isn't mentioned even once) and the PNS Ghazi. The latter, we gather, has sailed from Karachi around the Indian subcontinent in a bid to open up a sea route for Pakistan's supplies to its soldiers in East Pakistan at the height of the Bangladesh liberation war. The two vessels fire torpedoes at each other even as a host of challenges erupt aboard the Indian submarine - all par for the course. This is a story of courage and heroism against all odds. Immobilized by multiple technical breakdowns, the S-21's movement is severely curtailed but the valiant men aboard hang in there. The S-21 is captained by the arrogant and hot-headed Rann Vijay Singh (Kay Kay Menon, his mannerisms intact). Not one to play by the textbook, his credo is as in-your-face as it gets. You don't win wars by becoming a martyr, you win by eliminating your enemies, he thunders. Singh brooks no opposition, but Lieutenant Commander Arjun Verma (Rana Daggubati in a restrained avatar), who's been deployed by naval headquarters to keep the former in check, doesn't desist from speaking his mind. This leads to several tense moments on the submarine, endangering the vessel and its men. Executive Officer Devaraj (Atul Kulkarni, who stands out) is the second in command and he is hard pressed to hold the balance between the two temperamental men. Taapsee Pannu, fresh off the Pink triumph, is saddled with a walk-on part as a Bangladeshi refugee who turns out to be a doctor. As the only female face on board, she does no more than occasionally prettify the backdrop. One might be taken up a bit with the obvious novelty of the genre - The Ghazi Attack is India's first underwater war film. However, the fierce conflict off the coast of Vizag is reduced to simple us-and-them binaries. As a result, the film plays out strictly by numbers. There is never any doubt who will have the last laugh. As the film nears its business end, the filmmaker dutifully whips out not only the national anthem but also a rousing rendition of Saare jahaan se achcha and the inevitable raspy Bharat Mata Ki Jai war cry. And also, as the spirits of the men on the S-21 threaten to hit rock-bottom in the face of growing adversity, the boss on board delivers an overly shrill pep talk focussing on the sacrifices that soldiers make so that the rest of the nation can sleep in peace? No bones are made about the fact that this hectoring speech is meant more for those in the auditorium than for the fictional platoon. Isn't that how it always is when the antagonists are Pakistanis? But The Ghazi Attack isn't just about projecting the enemy as a bunch of sitting, but vigorously quacking, ducks. It is also about trying to simplify the complexities of warfare and dragging it down to a point where military conflict begins to resemble a noisy video game. The high-tech sonars on the two subs work overtime to pick up every little sound vibration that travels through the waters, but when the Indians belt out Saare jahan se achcha, the strains waft all the way to the enemy vessel on their own, defying all laws of hydro-acoustics. Much water has flown down the Bay of Bengal since the 1971 Indo-Pak war changed the face of the subcontinent, but the PNS Ghazi mystery, at best a 1971 footnote, persists. This film does not do much to increase our desire to dive deeper and learn more about that obscure chapter. Even so, do watch The Ghazi Attack. We haven't, for sure, ever seen anything quite like it in this country.